Are you a Marketing Manager using Marketo? Are you facing problems in ensuring your marketing emails are being delivered to the recipients’ inboxes? Do you know where your marketing emails are actually stuck? If the first answer is ‘yes’ and the second is ‘no’, then you have landed yourself in the right place. Designing a marketing program is a tough job for a Marketing Manager. It is a nightmare to see low success rates in marketing campaigns. Poor email delivery not only cuts down on Marketing ROI but also questions the relevance of a Marketing Program initiated by a marketing professional. This post describes about improving email delivery in Marketo that is now the most widely-accepted Marketing Automation platform across the globe. Using Marketo is pretty simple and any marketer with some basic technical knowledge can start using it. The problem really surfaces when you see poor responses to your marketing campaigns. It is very likely that emails are getting bounced. While it is important to understand what email bounce is, it is equally important to know the reasons and corrective action to be followed. What is an Email Bounce? In the simplest language, when an email is rejected by a subscriber’s email server, that is called a bounce. There are several possible causes, though temporary connectivity issues and invalid/incorrect email addresses are the most common problems. Once the reasons for bounces are discovered, then it is possible to address them Soft bounces are caused by temporary problems and it is likely that the next time the email is sent, it will hit the mailbox. Sounds simple; unfortunately it is not. A marketer must design a campaign so as to give sufficient time to let the temporary issue go away before sending another email. 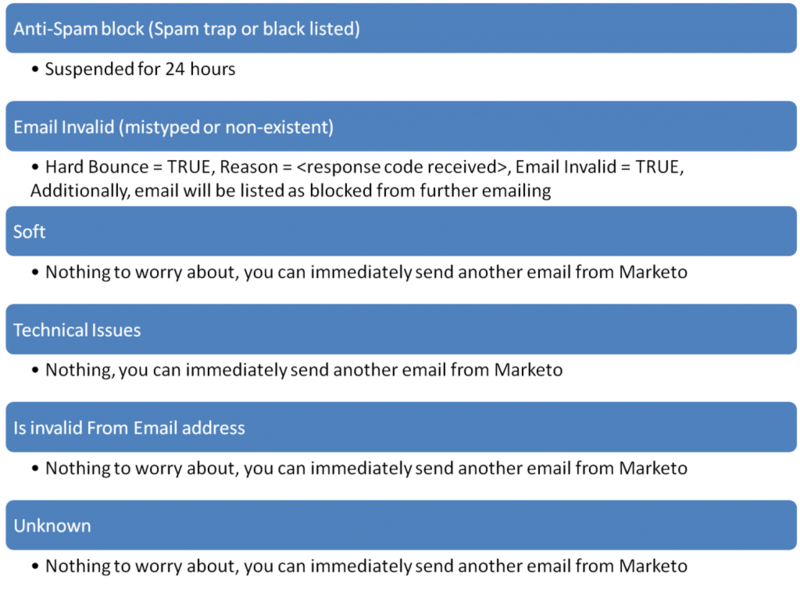 If emails are continuously sent with a soft bounce result, you are landing yourself in trouble that may result in blacklisting of your IP Address. It is hence recommended to suspend the soft bounce emails at least for 24 hours. Now what about hard bounces? The answer is pretty simple – SUPPRESS them from the mailing list. In a perfect world this looks easy; unfortunately, in reality, there could be several reasons other than an incorrect email address for a hard bounce to occur. It is important for a marketer to get control over the activities and compare results before suppressing the records from future emails. Soft bounces: Marketo suspends soft bounces for 24 hours and then retries sending them emails. Marketo maintains two fields called “Email Suspended” and “Email Suspended at” to take care of the soft bounces. Hard bounces: Whenever Marketo receives a hard bounce, Marketo marks that record as “Email Invalid” and suppresses the record from future emails. How Marketo REALLY deals with email bounces Most people think that Marketo automatically take cares of the hard bounces and suppresses them automatically from future emails. The truth is that Marketo marks only certain types of hard bounces as “Email Invalid” and suppresses them from future emails. These records are usually those where Marketo receives a bounce code stating that the email is not valid. 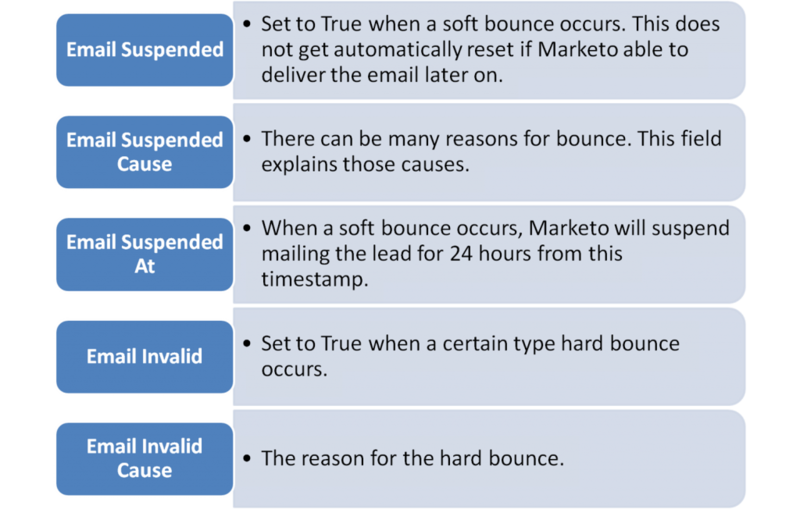 There are other reasons for which a hard bounce can happen and Marketo will continue to send emails to those records. The team at RightWave has worked extensively on providing services around the Marketo platform and has closely studied the email delivery model to devise solutions with proven results to improve email delivery in Marketo. Email Invalid: If “Email Invalid” is TRUE. Email Suspended At: If “Email suspended At” is not older than 24 hours. A healthy opt-in list should not have a bounce rate higher than 2-3%. For regularly-generated higher bounce rates, it’s important to work out why and take action to reduce the number of bounces. This post has outlined the challenges Marketers face in ensuring email delivery using Marketo and the technical know-how they should have in such a complex Marketing Automation system. Our second and final post on this subject will help Marketers understand the industry best practices and what precautions one should take to make the best use of Marketo and its capabilities. RightWave is delighted to provide its customers with more details on the features, drawbacks, and implementation steps, and can assist in the process. For more information on RightWave’s services, please Contact Us.